The Warrior Prophet picks up where the Darkness that Comes Before ended. Bakker expands on the world of his story as the Holy War marches south towards Fanim lands with Cnaiür urs Skiötha advising the Great Lords on how to prosecute the war. And with Cnaiür marches Kellhus, the Prince of Nothing, a man on a mission to kill his father. To accomplish that he must seize the Holy War as his instrument, defeat the Fanim, and wipe out the Cisharuim whom Kellhus deduces his father must be a member of. With Kellhus travels Achamian who falls into his favorite role as teacher. Still reeling from discovering the Consult’s skinspies, abominations who can take a person’s appearance and pose as them, Achamian is unsure what to do about Kellhus. He is the harbinger of the Second Apocalypse. The world is at stake and yet Achamian cannot bring himself to tell his fellow Mandate wizards. He knows they would seize Kellhus. And Achamian, like almost all who meet Kellhus, has grown fond of him. He cannot betray his genius pupil. He has been seduced into believing exactly what Kellhus wants. For Kellhus is Dunyain, bred to an intellect beyond normal men. To him, emotions are merely the yoke he enslaves those around him. To possess the Holy War, Kellhus must become a prophet. Through lies, truths, and manipulation, Kellhus sets about manufacturing the circumstances of his new role. But the powerful take note from the Consult to Conphas, and intrigue and danger swirls about Kellhus and his companions. 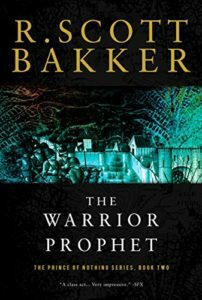 The Warrior Prophet continues the level of intrigue, politics, complex characters, and philosophy of the first book, adding to it the brutalities of war. The Holy War is holy in name only as its fighters commit atrocities on their long-hated enemies. Bakker captures the full swath of human nature, the good, the bad, and the ugly, exposing it with an unflinching eye. 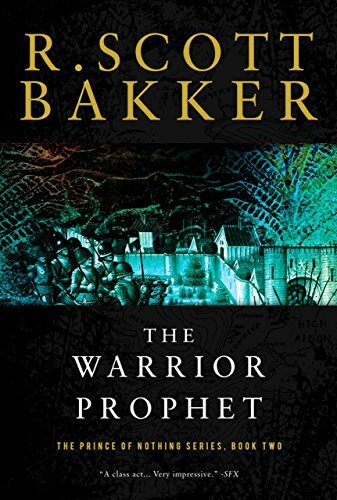 You can buy The Warrior Prophet from Amazon!